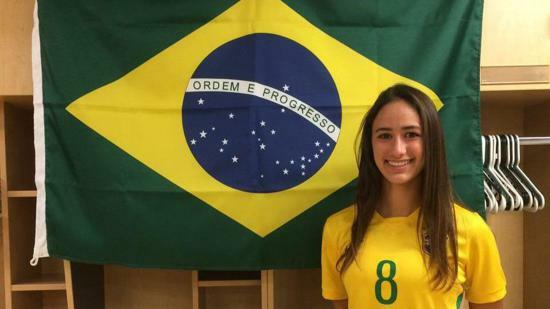 Bianca Caetano-Ferrara is playing for her mother’s Brazilian homeland. That would be Bianca Caetano-Ferrara — Tierrasanta resident, Cathedral Catholic High junior and dual citizen representing her mother’s homeland while debuting this year on the international stage. Caetano-Ferrara scored two goals in a 4-0 victory over Bolivia to earn MVP honors during pool play of the South America Cup tourney that doubled as World Cup qualifying. Brazil eventually placed second to advance to the World Cup in Jordan from Sept. 30-Oct. 21. There’s no topping the World Cup’s prestige, but it would be hard to beat the atmosphere for the South America Cup final between host Venezuela and Brazil on March 20, when a crowd of 41,000 packed Estadio Metropolitano. Venezuela prevailed 1-0 for the title, while Brazil finished 5-1-1 in the tourney with Caetano-Ferrara earning her first seven international caps. Against Bolivia in Brazil’s third game, the 5-foot-7 midfielder scored her initial international goal with a left-footed shot off a dribble. Then she added her second to contribute to a 3-0 halftime lead. After the game, she gave interviews in English, Spanish and Portuguese. Caetano-Ferrara grew up with some Portuguese spoken in her house, and she periodically visited relatives in Brazil. From a young age, she even considered playing one day for the Blue, Green and Yellow. The opportunity came unexpectedly, though, as a result of Caetano-Ferrara catching the attention of an opposing coach with Brazilian ties while playing for the San Diego Surf club in June last year. Based on the coach’s recommendation, she was asked to submit a video, and by December, she was in training camp with the Brazilians. As it happened, too, the technical side of soccer that Caetano-Ferrara learned in the U.S. applied well for the Brazilians. She started in the game at age 5 along with her older sister, Julia, 19, a former Cathedral Catholic player now in pre-med studies at USC. In mid-August, Caetano-Ferrara reunited with the Brazilians in a week-long training camp with their U.S. counterparts in Grand Rapids, Mich. Though she was slowed then by an MCL sprain, Caetano-Ferrara is on the way to a full recovery for the World Cup. The tournament will also end play for the U17 team, so Caetano-Ferrara will next turn her attention to the U20 level and maybe someday the women’s national team. Bianca, making a name for herself around the world.